By your twenties, most people have experienced submitting their first job application. Whether you’re in the first stage of submitting a resume or awaiting your final decision after the interview, we’re here to explain the do’s and don’ts of how to “Follow Up”. If you have recently submitted your job application, whether online or through a physical form, it’s okay to send one email afterward to give yourself an edge. This email should include an introduction about yourself, a possible factor that should set you aside, and a quick reminder of your excitement and enthusiasm. This email should be no more than a few sentences – nothing too long! This way, you will showcase your dedication to the job without appearing to be overbearing. I would love to take a moment to introduce myself. My name is (insert name) and I recently submitted my application for your (insert position). I hope you have received my application, and I am excited about the opportunity to further showcase why I am the best candidate for this position. I look forward to hearing from you! Thank you for your time. After any round of the interviewing process, you should absolutely send a follow up, thank you email. Showing your respect of the interviewer’s time and appreciation will always set you aside as a caring, thoughtful candidate. Be sure to send the thank you email within 24 hours of the screen or interview. Afterward, if you have not heard back within 5 business days about the status of the interview, feel free to send another email inquiring about the process. Don’t be too pushy – but it’s absolutely okay to ask about when you should expect to hear back about the status of your interview. Again, make sure to send a thank you note directly after the interview has taken place. Whether the thank you note is composed as an email or handwritten letter, make sure to continue to portray yourself as a dedicated candidate. In regards to a follow up email about the status of your interview, wait until the given date has passed in which you were guaranteed information. During the interview, you are allowed, and sometimes even encouraged to ask when you should expect to hear back about being hired. So, if this date has passed, you can send an email referring back to the status of your interview. Make sure to keep this email clear, concise, and professional. I wanted to touch base on the status of the interviewing round. You previously mentioned that I should hear back within a week. I am wondering if there are any updates about this progress? Please let me know at your convenience. Thank you for your time, and if I can provide any other helpful information I am more than happy to! As you can see, follow up emails are, for the most part, completely acceptable and even encouraged! 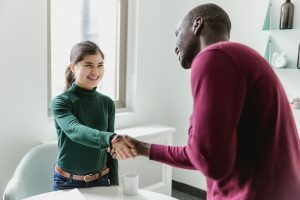 With these tips, you are sure to create a professional, positive relationship with the hiring manager you are interviewing with. Looking to start your application process? Check out our open jobs! Need help before applying? Read our blog about how to update your current resume! Interview Dress: How to Do it Right Relieving Stress: How You Should be Doing it!